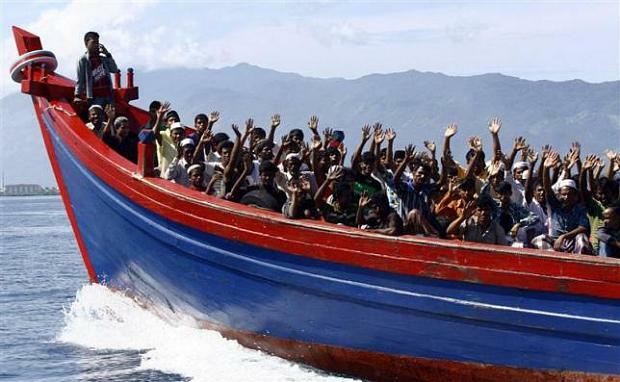 Myanmar and Bangladesh face renewed pressure to tackle “the root causes” of an annual migration crisis after Thailand today (26 November) announced a regional summit ahead of the new sailing season. Tens of thousands of Rohingya Muslims have fled western Myanmar in recent years, joined increasingly by Bangladeshis escaping poverty, on dangerous and often fatal sea journeys through the Bay of Bengal towards Malaysia. Boats crammed with migrants traditionally depart following the end of the monsoon season expected in November. It is not clear whether migrants will take to the seas in the same numbers this year after Thailand launched a crackdown on major human trafficking rings in May. That resulted in thousands of migrants being abandoned in fetid jungle camps and at sea and the arrest of scores of people, including a Thai general and other officials for orchestrating the multi-million dollar trade. Stories of kidnap, coercion and hunger emerged from the hundreds who staggered ashore or were belatedly rescued by Thai, Indonesian and Malaysian authorities after weeks at sea. In a statement announcing the 4 December summit in Bangkok, Thailand’s Ministry of Foreign Affairs said the crackdown had resulted in a “substantive” reduction of the trade. But it added that “more needs to be done to solve this problem effectively and permanently”. “Affected countries in the region and relevant partners must work together to address the root causes as well as all the contributing factors along the way,” the statement said. Thailand has invited Bangladesh, Myanmar, Indonesia and Malaysia to participate in the summit as well as representatives from the United Nations, the United States, Australia, Japan, Switzerland, the European Union and NGOs. Bangkok’s use of the phrase “root causes” is a nod to Myanmar’s ongoing persecution of the Rohingya, many of whom live in apartheid-like conditions in western Rakhine state following deadly clashes with local Buddhists in 2012. The government does not recognise the term Rohingya, arguing that the Muslim minority are in fact illegal immigrants from Bangladesh, despite many families tracing generations-long ancestry. Myanmar has so far refused to acknowledge that the Rohingya are fleeing persecution. Bangladesh has also been accused of not doing enough to stop its impoverished citizens leaving its southeastern shores. Thailand held a similar summit at the end of May during the height the migrant crisis. But human rights groups criticised the May summit for being little more than a talking shop in a region known for favouring consensus diplomacy ahead of direct confrontation. With the sailing season nearing, rights groups are now closely watching for signs the smuggling gangs are still active.